Be the first to share your favorite memory, photo or story of Ludwig "Bud". This memorial page is dedicated for family, friends and future generations to celebrate the life of their loved one. 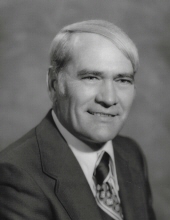 Ludwig William "Bud" Johnson, age 92, of Perry, Oklahoma, passed away on August 17, 2018 at Perry Memorial Hospital. Bud was born at his paternal grandparents' house on April 29, 1926 in Perry, Oklahoma to Charles G. and Vera (Kinnick) Johnson. He lived in Sumner, Oklahoma, graduating from Sumner High School. He then joined the Navy on February 27, 1945 and served as Seaman First Class SV-6 until being honorably discharged on July 5, 1946. He then went to and later graduated from Oklahoma A&M College (later to become OSU), where he studied agriculture and met his wife, Albertine "Abbie" Baird. They were married in the home of her parents, Mr. and Mrs. A.G. Baird in Waynoka, Oklahoma, on September 18, 1949. He served on the State Board of Public Affairs under Governor Bellmon and Governor Bartlett. He was on the board of directors for the First Bank and Trust in Perry. He became the Director of Housing Management in Oklahoma City, the State Director of the Farmers Home Administration (FmHA) and Assistant to the FmHa Administrator in Washington D.C. He also was a Rural Development Specialist for Oklahoma State University. They lived in Alexandria, Virginia and Oklahoma City during this time. After retiring, he moved back to Perry to manage his farm and ranch interests and became active in the Perry Rotary Club. Bud is survived by his wife, Abbie; son, Jeffrey and his wife Leslie; two grandsons, Jacob and Jordan of Oklahoma City and his sister Verona Southern, a nephew, two nieces and numerous cousins throughout the United States. He was preceded in death by his parents and sister Janiece (Johnson) Bolder. Casket bearers will be Joe Sewell, Stan Schuermann, Wayne Hasenfratz, Everett Lighty, Leonard Ketchum and Verl Brorsen. Honorary casket bearers will be George Bellmon, Elmo Bathurst, Bud Grim and Bart Brorsen. Family visitation will be held on Tuesday, August 21, 2018 at Trout Funeral Home of Perry from 6:30 pm to 7:30 pm. A celebration of Bud's life will be held on Wednesday, August 22, 2018 at 10:00 a.m. at the Presbyterian Church with Reverend Josh Kerr officiating. Burial will then follow at the Grace Hill Cemetery in Perry, Oklahoma. In lieu of flowers, memorial contributions can be made to the American Heart Association or the American Cancer Society in care of Trout Funeral Home of Perry, 1408 N. 7th St., Perry, OK 73077. The family would like for friends to share condolences at www.troutperry.com. To send flowers or a remembrance gift to the family of Ludwig "Bud" William Johnson, please visit our Tribute Store. "Email Address" would like to share the life celebration of Ludwig "Bud" William Johnson. Click on the "link" to go to share a favorite memory or leave a condolence message for the family.